Whitey Ford is a famous Athlete from USA, he is 90 years old and still alive, born October 21, 1928. Edward Charles "Whitey" Ford was a Major League Baseball pitcher who played his entire career for the New York Yankees. Whitey Ford was called for his light blond hair. 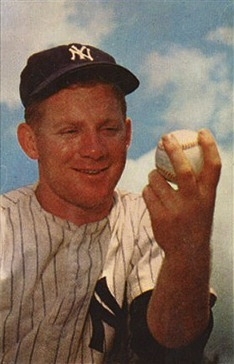 He played in the New York Yankees 1950-1967, except for two years in the Korean War 1951-1952. He won 236 games for the Yankees, which is still the most wins for a pitcher in the Yankees (a winning percentage of 69.0%). He was voted into the Hall of Fame in 1974. He is born under the zodiac libra, who is known for Balance, Justice, Truth, Beauty, Perfection. Our collection contains 9 quotes who is written / told by Whitey. "Sooner or later the arm goes bad. It has to... Sooner or later you have to start pitching in pain"
"The way to make coaches think you're in shape in the spring is to get a tan"
"I know Koufax' weakness. He can't hit"
"Hell, if I didn't drink drink or smoke, I'd win twenty games every year. It's easy when you don't drink or smoke or horse around"
"Army life was rough. Would you believe it, they actually wanted me to pitch three times a week"
"You would be amazed how many important outs you can get by working the count down to where the hitter is sure you're going to throw to his weakness, and then throw to his power instead"
"There's no easier pitch to hit than a splitter that doesn't do anything"
"I never threw the spitter, well maybe once or twice when I really needed to get a guy out real bad"
"You kind of took it for granted around the Yankees that there was always going to be baseball in October"